8″ x 8″ x 1.5″, oil on on deep edge canvas, ready to hang. $227 (approx. £171, €195) with free shipping. 31.75″ x 31.75″ x 1.8″, acrylic on deep edge canvas, ready to hang. $2190 (approx. £1652, €1880) with free shipping. The moon and the stars is the theme for the two paintings I’m showing you today. Each painting relates also to a saint and along with being celestial expresses a way of seeing a world full of poetry and magic. It is said that on the south west coast of Ireland in the early part of the 6th century, Saint Brendan sets sail in a leather-clad boat along with 16 monks to search for the Isle of the blessed. Some say he managed to cross the seas, landed in Greenland and then reached America 1000 years before Columbus and centuries before the Vikings. 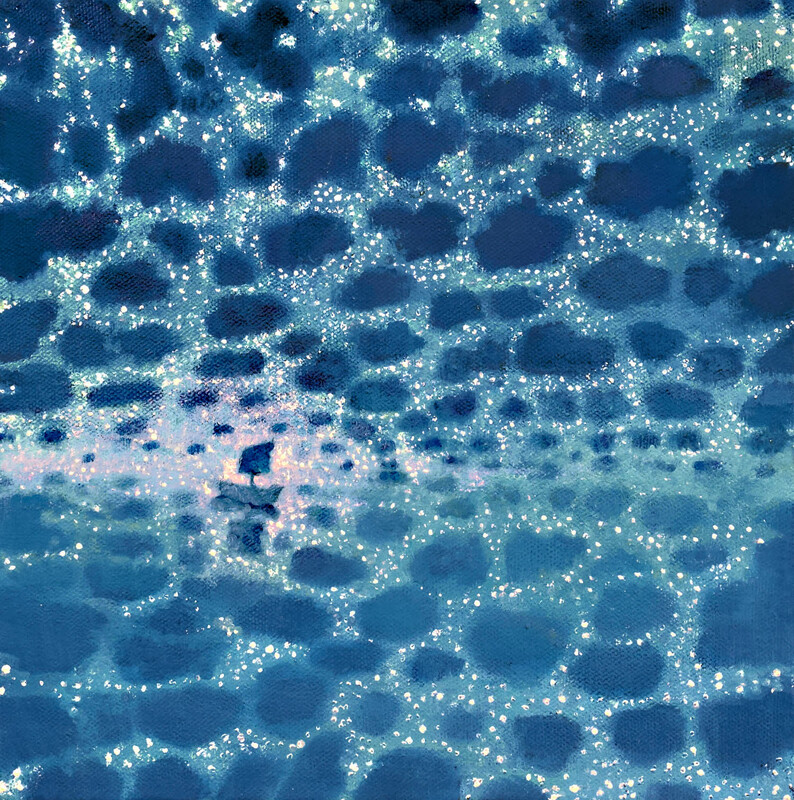 I started the painting by making a pattern of stars and rounded clouds across the canvas to convey the still, calm of the sea reflecting the heavens above. The sea’s stillness reminded me of childhood. When given a folded paper boat, I placed it on the still water. What would it do? Sink? Miraculously, it floated and, like I hoped, with the littlest of breezes sailed to the other side of the pond. The child’s small decision of placing a delicate paper boat on the water and wishing it to move and reach the other side made me think about the leap of faith Brendan took when starting his voyage and the trust he placed in the stars and the Moon. In our lives, any journey into the unknown, including any new creative project such as starting a painting calls for that belief that the stars will align for us. Saint Hippolyte le Graveyron as it’s fully called is a place I like to return to in my paintings. The village, situated close to the ‘Dentelles de Montmirail, has a quiet spell-like quality especially when you walk up one of its hill and look ahead. One thing you see is another hill and on its crest, a line of Mediterranean pines stand out against the skyline. Have you noticed, sometimes at dusk, the light shimmers with a luminescent green-blue colour? In the painting, the full, glowing moon rises through the trees. Colours are altered, subtly. I sought to make this a moment so hushed and quiet, you feel it’s time to stop and reflect. Tell me, what comes to mind when seeing these two paintings? Brilliant. Keep going back to see another colour appearing. Both of these take my breath away, John. “Brendan and the Stars” really evokes the sensation of being adrift in a tiny craft on a vast sea where heaven and earth become one dazzling plane. The use of tone and scale to suggest a horizon line where there is none is fantastic. Your anecdote of the paper boat is so fitting. The viewer can sense the leap of faith, the fear and exhilaration of setting off into the unknown, and the sheer beauty and magnitude of the boundless night. It is like a fantasy seascape — the image of the emotional experience of such a journey. The palette of “Dusk,” the banks of color across the field, the light through the distant trees, and that magnificent and sublime moon create a kind of quiet ecstasy. I love the light, and particularly admire the use of the deep browns, violets, and reds in the foreground, and the luminous green-blue in the heavens. Both of these remind me of the awesome power and mystery of nature and our very small place in it. Thank you for making my Sunday evening more beautiful. Hello John, thank you for another visual treat! ‘St Brendan’ is magical, enchanting and truly dreamlike as the sky and the sea swirl together amidst the pink light of the moon. The little boat floats bravely onwards into the unknown, overwhelmed by the vastness of nature. It is very imaginatively depicted and the limited palette is used to great effect. I particularly like the flecks of white which highlight the tips of the waves or could it be the milky way reflected on still water? 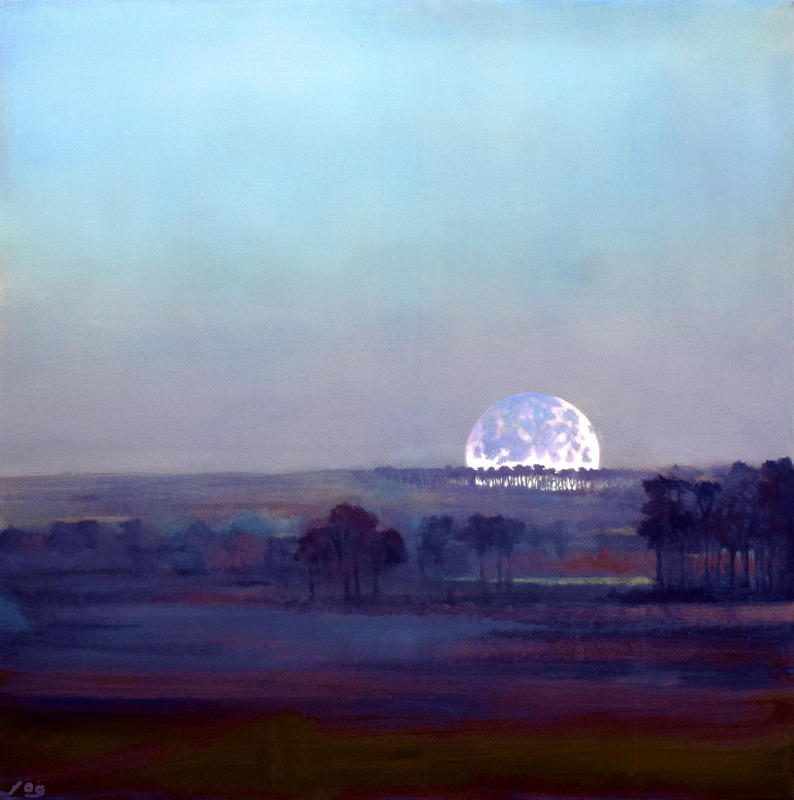 ‘Saint Hipolyte’ has a most exquisite moon and the effect of its light on the colours of the landscape is very delicate and beautiful- violets, earthy reds and blues and the subtle tinge of green (I know what you mean by this moolight effect). The sky is quiet and still with a pink bloom. I particularly admire the latticework sillhouette of pine trees on the hillside. Congratulations! Thank you very much for your lovely insights into the paintings. The limited palette you mention, is interesting as it accentuates the shapes and patterns across the painting. The flecks of white were meant to be the reflections on still water but could be seen either way and now that you mention it that interests me. Yes the moon and its enchanting light in St Hippolyte is I agree a very quiet and still, I think that the composition does that and also the muted palette. Glad you like the pine trees, I spent a long time on those.